Make dressing: place all the dressing ingredients in a jar with a lid, shake and place in the fridge. 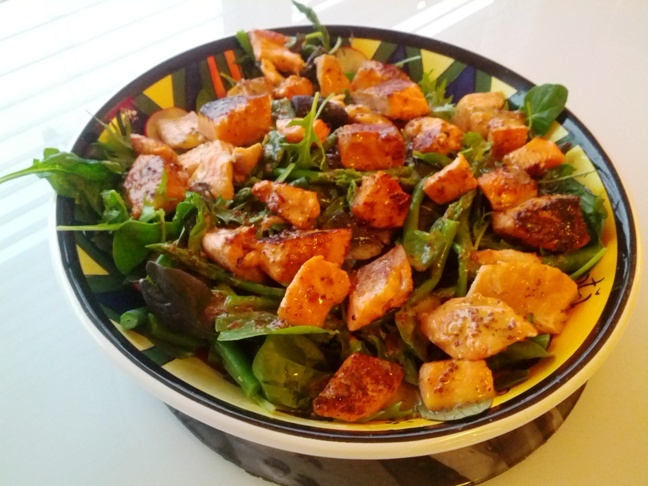 Marinate salmon: whisk together in a bowl 2 tbsp honey, lemon juice & pepper and toss the salmon pieces until they are coated & set aside. To blanch veges: fill a large pot with 2 cups of water and bring to the boil. Add trimmed beans & asparagus. Cook for 1-2 minutes, strain and place veges in ice cold water. Strain & set place into a large serving platter or salad bowl. Heat a non stick fry pan over a medium to high heat. Place marinated salmon in the pan and cook for around 3-5 minutes. 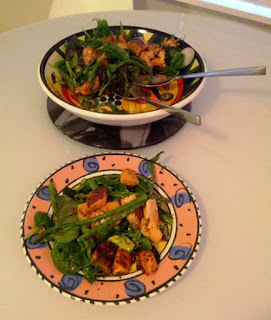 To serve: Place salad greens, beans & asparagus into the serving platter, place salmon over the top & pour over dressing with some freshly cracked pepper to taste. Bon appétit!